This is a very simple and easy dish to make; a very typical home cooked food that most Indian household would prepare. It is wholesome, perfect accompaniment with any other dishes. My mother used to make this dish for the family, and liked by all members in the family. As we used to live as an extended family such dish was rather an easy meal to share amongst all – Spinach & Dhal always a winner. It is always the simplest and easiest food that taste so good, and yet full of all good things. 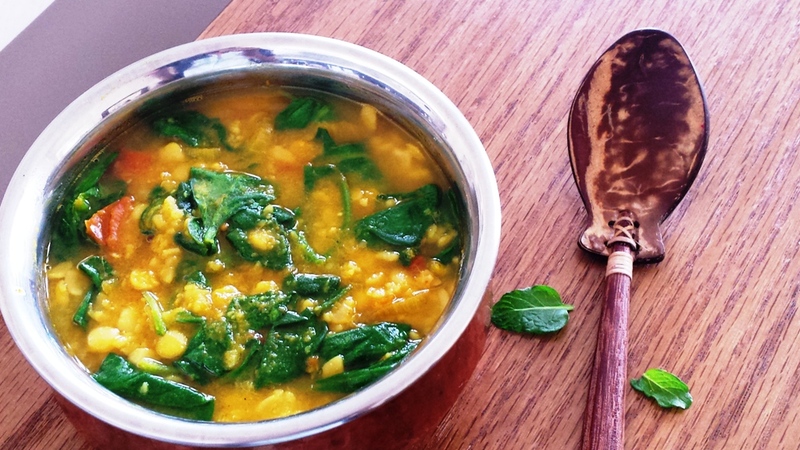 With the addition of spinach to the dhal, makes this dish a rather full of protein and iron ccombination. Whenever I feel a good energy boost is needed such dish has to be made, and it revives me. 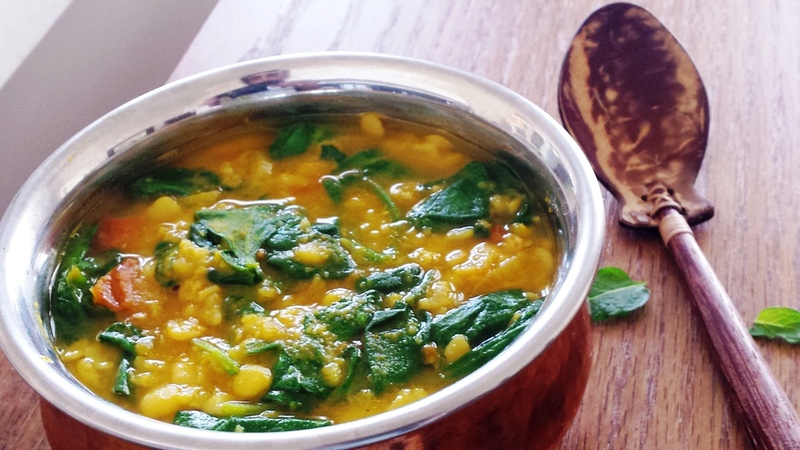 Dhal & Spinach is great with simple boiled rice, Roti, Pharata,Pitta, Naan or even fresh or toasted bread. Wash the dhal in cold water. Place the washed dhal/lentils in a deep saucepan. Add the water, cloves, bay leaves, salt and bring to the boil, then simmer for around 15-20 minutes, until the dhal/lentils start to break down and become soft. (You will need to keep an eye when boiling dhal stirring occasionally and removing the white foam like scum that comes up as the dhal comes to a boil). 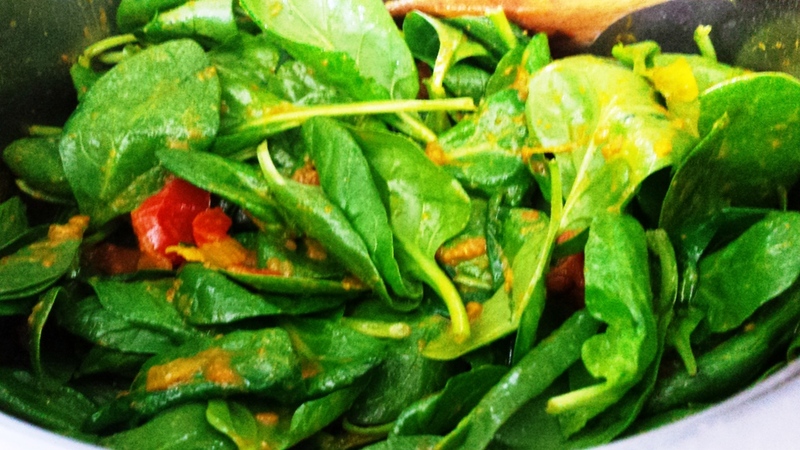 Stir all together until golden in colour, add the garam masala, chopped tomatoes, spinach leaves and cook on a gentle heat until the spinach have wilted not but not mushy. Now add the cooked dhal/lentils to the saucepan and leave to simmer for another 5-10 minutes until all the spices have incorporated into the dhal. Taste for seasoning and add as necessary. Add a handful of the chopped coriander into the mixture. If you are adding chilies, leave them whole and add at the end as a garnish.